If there’s one particular moment of self-discovery that I’ve had in the past couple of months, specifically as it pertains to my relationship with video games, it’s that I almost certainly have a type. For context: my birthday brought with it a gift simultaneously fortuitous and vexing – Metal Gear Solid V: The Phantom Pain, bestowed upon me by my childhood best friend despite the fact that I had never played a single Metal Gear game before. Given that I often derive a great deal of enjoyment of specific games from their narratives, this immediately presented a challenge, one that I chronicled in detail in an article I published back in August – how was I supposed to fully immerse myself in this universe whilst possessing dozens of perceivable blind spots in regards to its narrative progression? I would find myself watching cutscenes all the while caught obliviously unaware to the nature of their significance in setting up the series’ endgame chronicled in Metal Gear Solids 1, 2 and 4. It represented a challenge – while I could invest myself in the moment-to-moment progression of Venom Snake’s character arc, some of the beats with the most profound emotional impact were initially lost upon me. This was only more of a dilemma given the fact that the game proved to be, as I had feared, substantially unfinished in terms of lingering narrative threads. However, by the time I finished The Phantom Pain, I had become profoundly invested in its world and characters, despite my lack of context regarding the rest of the series. I filled in the blanks through resources such as the Metal Gear Wiki, the power of Google, and the aid of the aforementioned friend who had gifted me the game, herself an avowed Metal Gear acolyte. In time, I became enthralled with the many intricacies that make up the backbone of the Metal Gear universe, my occasionally obsessive nature leading me to feast upon understanding every miniscule reference that I’ve come across in my twenty years in gaming. As an aspiring writer in all mediums, I also became fascinated by the work of Hideo Kojima, whose marriage of his cinematic inspirations with remarkably in-depth stealth gameplay was an experience to behold – the Metal Gear narrative might be obtuse, but there’s a level of artistry to it that sucked me in regardless of the occasional lapses into absurdity that Kojima is known for. I was stunned by my wholehearted acceptance of Metal Gear into my life, but the more I’ve thought about it in the past few days, the more it makes sense – especially given that my primary gaming “project” this year has been a comprehensive marathon of a similarly narratively obtuse, nigh-inaccessible series of niche games that I have loved ever since my childhood – which brings us to the subject of what is most assuredly going to become the longest-running series of articles I’ve written to date. Yes. I’m talking about Kingdom Hearts. It’s time to get Norted. I first discovered Kingdom Hearts on a trip to Pennsylvania when I was seven. We were visiting family, and had decided to stop by the home of one of my mom’s high school best friends so that they could catch up. I had met her friends’ two sons before, and we had gotten along well enough. When they were entrusted with the task of entertaining me, we retreated to their basement, a hallowed entertainment center within which their PS2 had laid, already turned on and ready to go. I was still operating primarily with my years-old N64 at that point, so this new disc-based console was an exciting presence in my immediate vicinity. Faced with the choice of what game to show me, one of the two boys withdrew a disc from a case and placed it into the PS2’s tray, the sound of light whirring signaling the beginning of an adventure across time, space, and licensed IP that would end up defining a large portion of my early childhood. The game started up – that was years ago now, but I can still recall how consumed I was by the opening moments. The incredibly stylish CGI intro set to the catchiest J-Pop song I’ve ever heard in my life. The tutorial, played out across columns of stained glass situated in the midst of vacuous darkness. The vague allusions to the Disney properties that would wind up defining the majority of the game, iconic princesses etched into the aforementioned stained glass. There was no critically-minded bone in my body that encouraged me to question why this child with the spiky hair was running around in what seemed to be a church dedicated to Snow White, Cinderella and Sleeping Beauty. I was seven. All that I cared about was that it looked cool. Then I finished the tutorial. And then I arrived at the main character’s home – the island. From what I can recall, I never made it off that island during my time in that basement. I don’t even think I made it to the end of the first section – I likely never even saw Donald and Goofy once during that experience. But I ran around that island for at least an hour, with no guidance, fighting the same four pre-pubescent teens and attempting to swim beyond the edge of the map. I was so invested in these menial tasks that, without my noticing, my “chaperones” had left the room. I eventually emerged from my fascinated stupor to this discovery, followed by another one – I had no idea where the exit to this basement was. And so it was that seven-year-old Connor began screaming at the top of his lungs, begging for his mom to deliver him from his underground captivity – an effort that lasted about ten minutes before she descended from the heavens in order to rescue him from dinner. My family returned home the following week, back to our daily lives. Within months, we would have a PlayStation 2, obtained by my father, and I became addicted to a game that was very much not the one I had played in Pennsylvania but likely appealed to me for many of the same reasons: Dragon Ball Z Budokai, released the same year. The game that I had played down in that basement slipped into the vast recesses of my memory for a multitude of reasons, the most profound of which being that I could not, for the life of me, remember the game’s name. It had vanished from my mind entirely, likely foreshadowing of one of the many modern criticisms of the series it would eventually spawn: long before the days of Birth by Sleep or 358/2 Days, even the name Kingdom Hearts itself felt like someone at Squaresoft had simply decided to mash two nouns together. I would eventually rediscover Kingdom Hearts two and a half years later, when excitement was building around the long-anticipated Kingdom Hearts II. Previews in magazines such as PSM and Tips and Tricks were touting many new additions to the game – the one that stood out to me the most being the addition of one of my favorite Disney characters of the previous couple of years: Stitch, of Lilo and Stitch fame. That said, even at ten years old, I had already manifested my desire to maintain awareness of every facet of a story – and so I pressured my Dad into buying me the 2002 original before KHII hit shelves. Imagine my surprise when I started the game up and I found myself back on those stained-glass columns, choosing my character build and answering questions to determine my rate of experience gain. I know this game, I thought – and was filled with jubilation that I had inadvertently rediscovered a memory long dormant. And so my long and storied relationship with Kingdom Hearts began. I’ve long had the theory that children born in my generation fell into either one of two categories: growing up, you were either a Disney Kid or an Anime Kid. Of the two, I was wholeheartedly an Anime Kid, my childhood defined by rushing through my homework in time for the start of Cartoon Network’s nightly Toonami block, then exposing me to classics such as Dragon Ball Z and Yu Yu Hakusho. This wasn’t to say that I held any disdain towards Disney – however, I was raised primarily on Pixar films, and so most of my Disney-based nostalgia was reserved for characters from Toy Story, Finding Nemo and The Incredibles rather than iconic 2D heroes such as Mulan, Simba and Ariel. While I knew these characters, they didn’t speak to me in the way that protagonists such as Goku, Yusuke and Kenshin Himura did. If you were aiming to sell me on Kingdom Hearts on the basis that I would get to hang out with Aladdin and Tarzan, or that I’d get to hear the most frustratingly orchestrated version of “Under The Sea” play on loop in Atlantica over and over again, I wasn’t your target audience. No – what roped me into Kingdom Hearts and has captivated me for the better part of a decade was the original characters and the narrative crafted around them. Sora and Riku were appealing realizations of one of the most classic anime tropes – the two best friends who double as nemeses/rivals – think Goku and Vegeta or Naruto Uzumaki and Sasuke Uchiha. (Having recently re-watched practically all of Naruto, the Riku/Sasuke comparison rings especially true to me in a modern context.) The manner in which the first game laid the seeds of what would become an expansive, all-encompassing mythology was captivating to me, as series creator Tetsuya Nomura anchored world-ending stakes around the survival of a single friendship. The parent-child relationship doesn’t exist in Kingdom Hearts; rather, the most important family that can exist is the family one chooses. 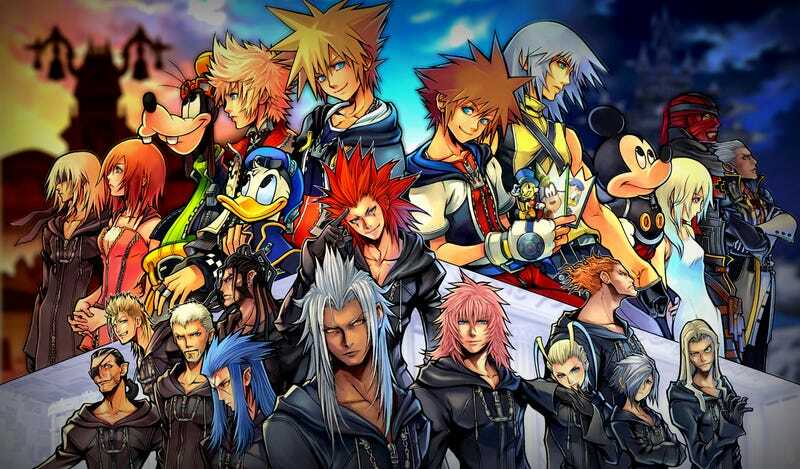 As Sora aptly states towards the end of the original game – and over and over again throughout the series – his friends are his power, and he is theirs. Just as compelling to me were the game’s various re-imaginings of iconic Disney characters. For me, the definitive versions of Donald and Goofy are their Kingdom Hearts iterations – stalwart friends who would die for each other as well as in the name of preserving a greater peace. When I think of Mickey Mouse, I think of the absentee king, foregoing his daily responsibilities to his people in the name of ensuring that they possess the slightest chance of a long-term future. Maleficent, already one of Disney’s most iconic and terrifying villains in the history of their catalog, takes her ambitions cosmic in Kingdom Hearts, serving as a worthy foe for the majority of Sora’s first outing. Having grown up a Nintendo kid, I had also missed the boat on most of the essential Final Fantasy games, meaning that the other significant draw – this one for an audience of Square fans - was also lost on me. But I grew attached to Leon, Yuffie, Aerith and Cloud despite having little to no knowledge of their origins at the time. Kingdom Hearts, throughout its decade-and-a-half of existence, has largely been a series about people without a home attempting to find their way back to one – and in the process, finding it in their friends. The Final Fantasy characters/Radiant Garden outcasts are the embodiment of this theme, grounding the stars of some of the most iconic narratives in gaming through the use of universal themes. All of this and more brings me to this particular piece you’re reading: I fell off of Kingdom Hearts after KH2, due largely to the fact that in order to play the various spinoffs, you needed a horde of consoles that I lacked the financial agency to purchase for myself. Years went by, and I watched as one of my favorite series from the PS2 era passed me by, worried that the day would come that Kingdom Hearts III finally appeared before me, and I would have no idea what had gone on in the multitude of games released since 2006. However, for the first time since the PS2, I received a Sony console for Christmas last year – the PS4 - and with it, an opportunity arose. The first purchase I made for my new console was Kingdom Hearts 1.5+2.5 remix, consisting of three games I had played to completion and three games of which I had very little awareness – and as I played through the box set, I fell in love all over again, working my way through both that saga as well as Kingdom Hearts HD 2.8 Final Chapter Prologue, last year’s compilation of games leading directly into the long-awaited Kingdom Hearts III. And now, three months out until KHIII, and with an ocean’s worth of words to write about my experience catching up, I present: this article, and the series of articles that will follow - one a week (aiming for every Wednesday), for every Kingdom Hearts game that I’ve played through over the course of the past year. Each one will serve as a comprehensive breakdown of my experiences with the particular game in question: my thoughts on the narrative, the gameplay (where applicable), and its place in the overall franchise – as well, as, of course, my general enjoyment of each title. Say what you want about the introduction of time travel, the plethora of Xehanorts, and the sheer preponderance of Keyblade Wielders prevalent throughout the later games in the franchise – I certainly intend to say it all over the next several weeks, as I work my way through this series game by game. But after playing every game in this franchise over the course of the past year, I can honestly say that my genuine love for Kingdom Hearts hasn’t wavered. It’s right up there in contention with The Legend of Zelda and Halo for the title of my favorite game series of all time. It features some of my favorite characters, settings, and musical scoring in video games, and the fact that the series has managed to sustain itself for sixteen years despite the fact that there hasn’t been a “mainline game” in twelve of them is an astonishing feat. It’s a series that wears its heart on its sleeve (no pun intended), and I consider it an absolute miracle that it even exists at all. I can’t wait to share my thoughts over the course of the next few weeks, and hopefully start a fun conversation in the process. Next week? We begin with the game that started it all: 2002’s Kingdom Hearts.